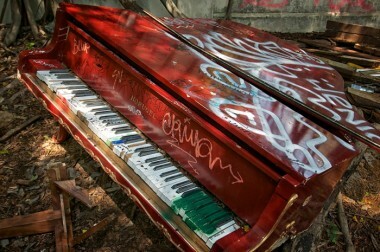 This impression was discovered as found art in an old broken down abandoned building on the North Shore of O’ahu. Roof gone, trees growing inside the walls piqued curiosity. Research uncovered that the room was once the music room of a reform school for boys. The big surprise – the school moved from this location in 1948 – more than six decades ago. Absolutely stunning that this red grand piano has been aging there in place all these years. A L O H A to all that enjoy or make music and anyone who has memory of piano practice.